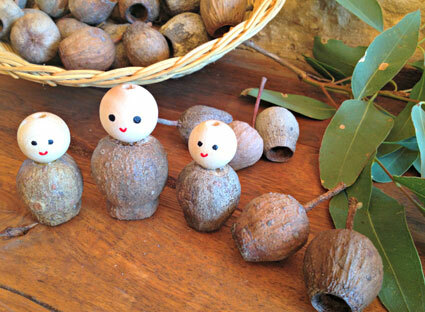 Gumnuts: check that they stand straight on a flat surface and don’t wobble. 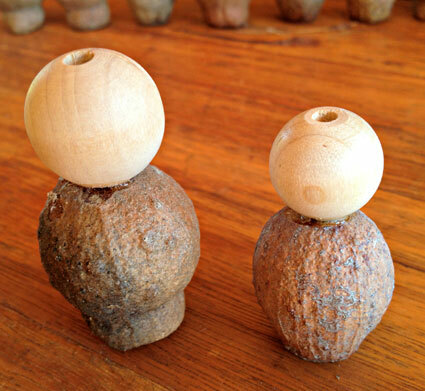 Natural wooden beads: I used 18mm for my smaller gumnuts & 22mm for the larger ones. Felt: I always use 100% wool felt, it looks and feels so much better than acrylic, and you’re supporting a sheep farmer instead of a polluting factory. 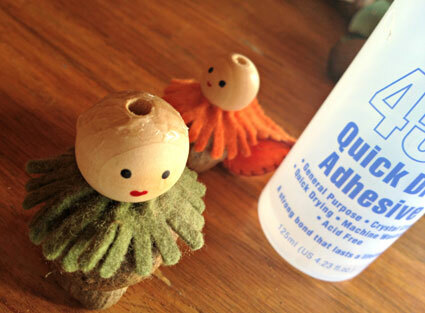 Glue: I used 450 Quick Dry Adhesive & E-6000. 1. Start by sanding a small flat surface at the top of the gumnut (only about 1cm diameter) so the bead has an even spot to adhere to. I used a belt sander, but you could hand-sand or file it flat. 2. 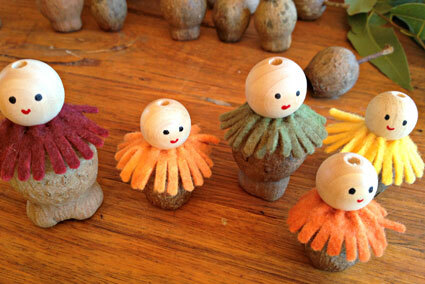 Glue the wooden bead head to the gumnut body. I used indstrial strength E-6000 glue for this job so there’s not risk of decapitation, I imagine any superglue would do. Allow to dry, sometimes I need to rest the head against a book so it dries in place before slipping off. 3. Paint or draw a face onto your gnome. 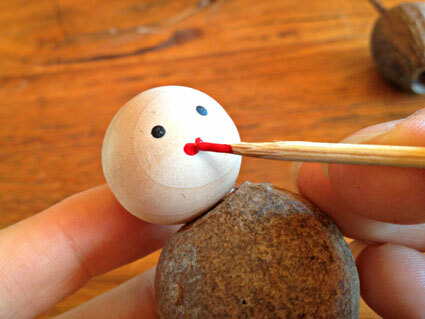 I use the ends of a skewer to make the tiny eyes and mouth with acrylic paint. Allow to dry. 4. 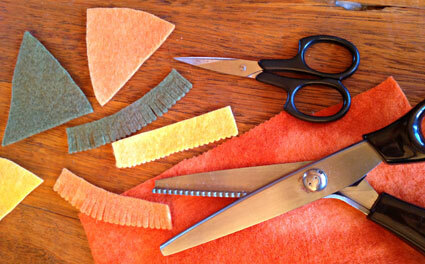 Cut out a strip of felt, 8cm by 1.5cm. I recently treated myself to these scalloped pinking shear scissors, so used them to cut along one long edge to neaten the decorative trim, but this isn’t essential. With small, sharp scissors cut slits along that edge, leaving about 5mm uncut. 5. 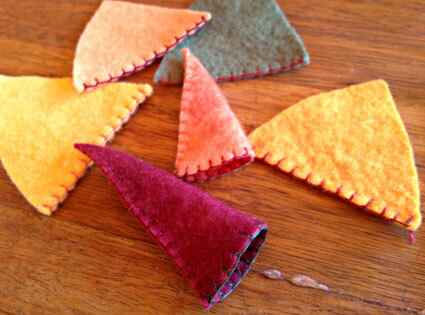 Using two threads of embroidery floss, sew a tiny running stitch along the uncut edge. Pull to gather together. 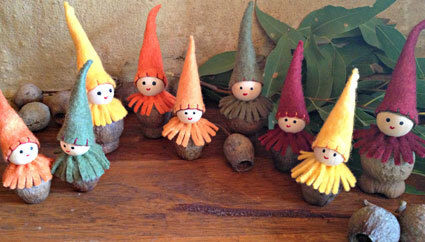 Wrap around the neck of the gnome, pull tight and then stitch and tie of a knot. 6. Cut out a hat. For the 18mm bead this is a triangle about 6cm along the hairline and 5.5cm tall. For the 22mm bead this is slightly larger – about 6.5cm along the hairline and 7.5cm tall. 7. I like to blanket stitch a contrasting rim along the hairline of the hat, using three or four threads of embroidery floss, but this isn’t essential. 8. Blanket stitch the sides of the hat together. 9. Dab a little glue on the crown of the head of the bead. I use 450 Quick Dry Adhesive but a gluegun would do the trick. 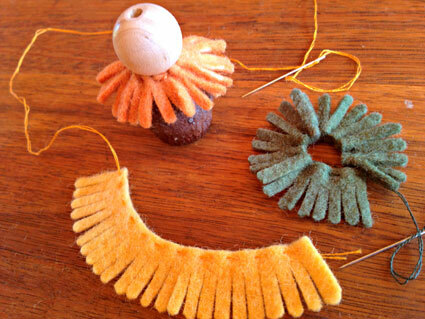 Stretch the hat gently and then slip it into place on the bead, removing excess glue. 10. Gorgeous! Well done! 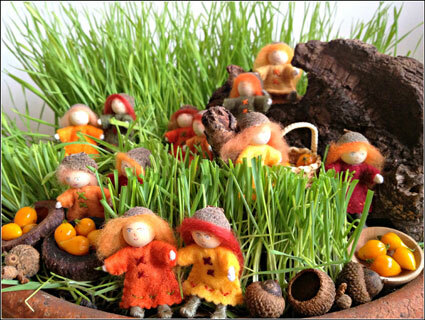 A bunch of these in Autumn tones will look great on your seasonal table or how about a gumnut gnome family for your child’s playscape? 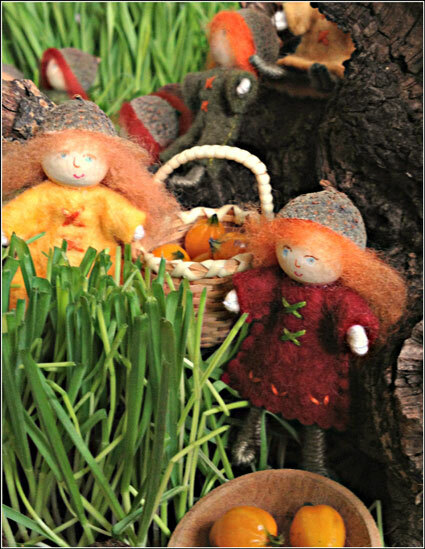 This entry was posted in Craft, Nature Table, Tutorial and tagged Autumn, craft, gnomes, gumnuts, nature table, tutorial on April 26, 2013 by Ange. 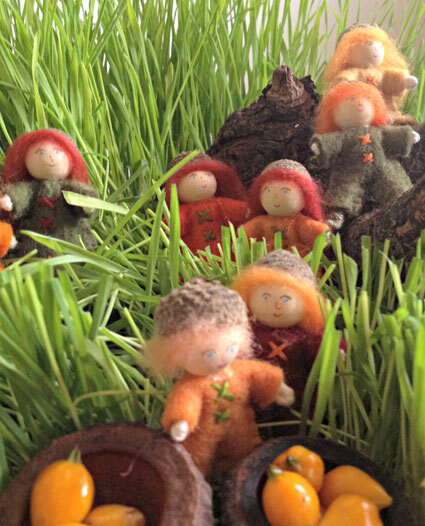 And so our Easter grass evolves into our Autumn Nature Table. Nature tables are a beautiful, simple way to celebrate the seasons, at the same time supporting our children’s development in a profound way. Children thrive on rhythm, it gives them a sense of security and wellbeing to know that what has been, shall be again. Creating and tending a small space in your home, gently drawing awareness to the change of seasons, also supports us as adults to live consciously with Mother Nature’s distinct soul moods instead of just being swept along with the passage of time. After all the joyful work of creating a beautiful space for Advent and Christmas, I often slack off over the holidays and usually forget to create a nature table for Summer. As the hotter months draw to an end I usually find myself re-inspired to create some little homescape for my extended family of Autumn faeries. With a collection of nut shells, acorn caps, tiny buckets and baskets they’re busy gathering their own Autumn harvest of red, orange and yellow berries. Our table will keep evolving as the season evolves. Although still so warm now, when it eventually cools enough for leaves to change colour and fall, Gracie will collect the finest specimens from our wanderings. No doubt our little geologist will find some amazing rocks that need to be displayed as well. Already this season’s table has served as a storytelling table, with a lovely rendition of a tale of some untidy gnomes living under the log and making a mess of the baskets of berries and nuts. 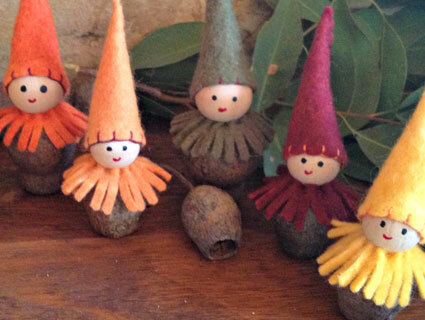 Is there a place for a littlle Autumness in your home? This entry was posted in Nature Table and tagged Autumn, faeries, nature table, seasonal table on April 11, 2013 by Ange.